Whoever you are Google is a good client to have, a good one to use as a name drop when meeting other potential clients. ZCorporation are already very well thought of for their 3D printing services among those who use them and know what they are. In helping Google with their promotion though ZCorporation will be getting a boost themselves as will 3D printing services in general when people see Google’s new promotional app and videos that will be seen by potentially millions of people. Many of them will ask how did they do that and a little research online may open up to them the possibilities of 3D printing services. The images and video for Google’s mobile app are being made by the US production studio Grow Interactive to promote the Google mobile search app. The idea is to use an American Cityscape, one that is characteristically American yet not a famous cityscape that people will instantly recognize. A cityscape needed to be created therefore but one that looked real, this ruled out CGI that with something as detailed as a entire city street would have been obvious and even to get close to realism would have been hugely expensive. Grow Interactive therefore chose to have something physical and chose to use 3D printing services to create a highly detailed and realistic American Cityscape: if it could be done in a quick and effective way and still be good value. Grow researched 3D printing services extensively and found that nothing compared with ZCorporation’s ZPrinters which had even been used before to create detailed cityscapes from data taken from real world buildings in New York. The ZPrinter 450 that Grow used was able to provide quick and good value printing that had great levels of detail and accurate color: this meant that what Grow had to do was take the parts they printed and assemble them as part of a ten foot set. Grow Interactive were able to print the cityscape with ease using their existing 3D design skills, having done many CGI videos before the only extra step was really to click print and see a digital CAD file become a physical object. The video was then made using stop motion animation to create the effect of each building being painted. Blank white but detailed models were used and then paint splashes came down over the buildings leaving a full color building. The blank and colored buildings as well as the paint splashes themselves were made using the ZPrinter with the stages of the paint coming down the sides of the buildings being done by hand. 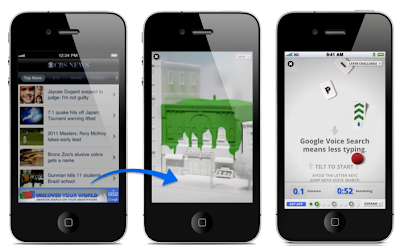 The concept was ‘uncover your world’ and in the app each building selected led to a video about how to use Google’s mobile search app and get the most out of it. After the video that showed the building being covered by paint the full color building was revealed, the idea being that the user eventually revealed each building.